The Quasi-series is about the pursuit of orders that are rigorously modular but wild—almost out of order. Quasicrystals, a new phase of matter discovered in 1982, represent this kind of material structure that hovers on the edge of falling apart. Unlike a regular crystal, whose molecular pattern is periodic (or repetitive in all directions), the distinctive quality of a quasicrystal is that its structural pattern never repeats the same way twice. It is endless and uneven, but interestingly, it can be described by the arrangement of a small set of modular parts. The Quasitable explores this aperiodic assembly in wood. 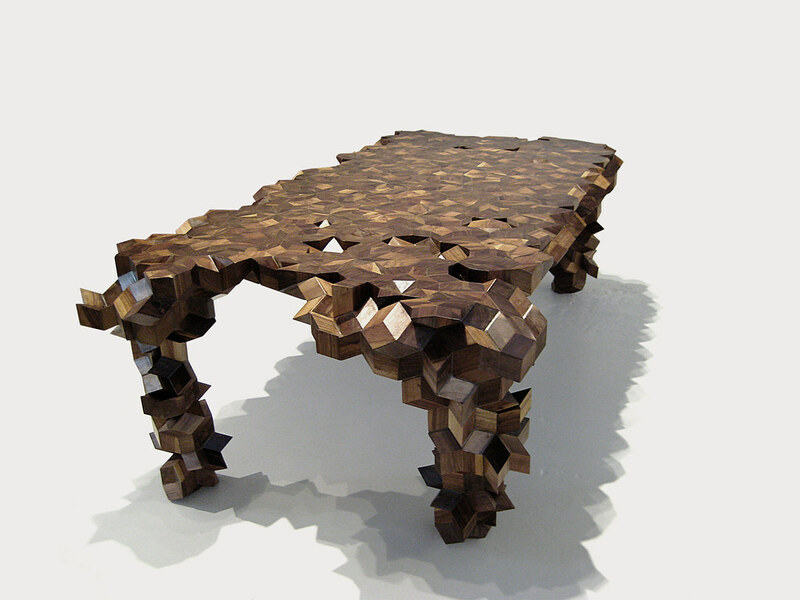 This large dining table is constructed from hundreds of individual walnut blocks. Though the pieces come together in infinite combinations, there are only two kinds of blocks: a “fat” rhomboid shape and a “skinny” one.